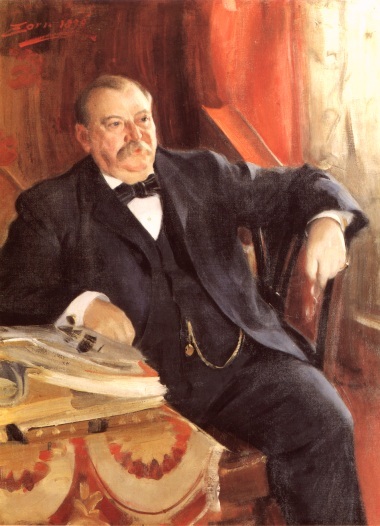 During Grover Cleveland’s eight years in the presidential chair, he confronted national problems nearly identical to those America faces today. There are numerous issues with striking similarities, but the three major ones stand out above all others are – the economy, paternalism, and foreign affairs. As a nation, our biggest concern today is the economy. Some economists estimate that we are in the midst of a mild depression. In 1893, as Cleveland began his second term, a major economic panic struck the United States, devolving into the worse downturn of the 19th century. This was the result of a bursting bubble created by government manipulation of the currency, not unlike our current crisis. The unemployment rate rose to an estimated 18 percent, the economy lost 10 percent of its value in two years, tens of thousands of businesses went bankrupt, while hundreds of banks closed their doors. The situation was dire. President Cleveland steadfastly adhered to Jeffersonian principles, refusing the plea of some to “stimulate” the economy. As a result, recovery came much quicker than it would have otherwise. The GNP grew by 20 percent in his final two years and unemployment dropped four points. As a Jeffersonian, Grover Cleveland understood that the best way to overcome an economic depression was through the use of laissez faire methods, keeping the government’s hands off the economy. Even before the economy tanked in 1893, an increasing number of American leaders were coming to believe the government should do more to help the common people in times of trouble. This notion of government paternalism was a central tenant in what would become known as progressivism. When the panic struck six years later, plans circulated around Washington to provide jobs to the unemployed. One proposal sought a $500 million appropriation for public works, a forerunner to the New Deal of the 1930s. But with a Jeffersonian President at the helm, those proposals fell on deaf ears. Grover Cleveland knew that if the government ever began programs to furnish direct assistance to the American people, it would only increase over time and likely never end. He had been proven right. With a few exceptions, foreign affairs had never been a major issue for most presidents until Cleveland’s second term. Progressives sought to expand America’s influence overseas, even intervening in the internal affairs of other nations. Some wanted to annex Hawaii, while others wanted to take Cuba outright. Cleveland said no to both plans, for he rightly realized that, like direct assistance at home, America had no business meddling in the lives of others and once adventurism began abroad, it would also likely continue in perpetuity. He was right again. Using the public life of Grover Cleveland as a guide, we should learn from our history or we are doomed to repeat its most painful mistakes. These issues, as well as many others, are covered in detail in my book, The Last Jeffersonian: Grover Cleveland and the Path to Restoring the Republic. This entry was posted in Economics, Foreign Policy, Paternalism and tagged foreign affiars, government, grover cleveland, jeffersonianism, leader, paternailsm, taxes. Bookmark the permalink.